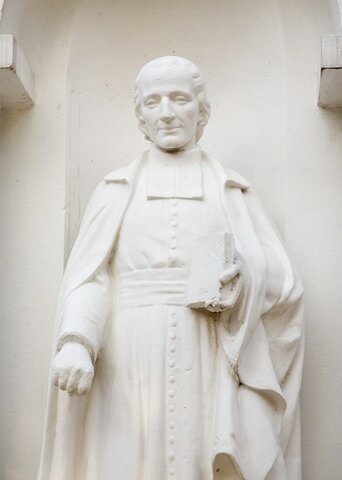 St Marcellin Champagnat, the founder of the Marist Brothers, is the life-giving root of Marist education. St Marcellin was born in 1789 in Marlhes, southern France. St Marcellin was ordained as a priest in July 1816, and in October of that year he was called to the bedside of Jean Baptiste Montagne, who at the age of 17 was about to die without ever having heard much about God. St Marcellin recognised that Montagne was a reflection of thousands of other youngsters who were also victims of tragic human and spiritual poverty. This event spurred him into action. From this, St Marcellin started the Marist Brothers, a religious order dedicated to “making Jesus Christ known and loved”. Whilst not an educational theoretician, St Marcellin did understand young people and their needs and showed himself to be a first-class educator of young people. The secret of his success lay in the great simplicity with which he related to his young followers and in his great confidence in them. St Marcellin dreamed of journeying to far-away lands to teach the youth about God. Unfortunately he was to die before realizing this dream, but eventually, not long after his death, the Marist Brothers made their way to Australia. Marist Education Today’, (1998) Institute of the Marist Brothers of the Schools.